My earliest memories include playing at the Bobbin Pond and the area near there that we called “The Rom” (now gravel pits). Where Doggetts (now Watermans) Primary School is now was a rubbish dump. We used to make rafts out of door frames and oil drums and float them on the lakes there. There was Walls’ Dairies and I had a Saturday job helping the milkman with his deliveries. Clements Bakers (in what is now Clement Mews) used to deliver bread all over the area and the Clements family had been bakers for generations. I remember that there was a polio epidemic in Rochford in the 1950s, which was rumoured to have originated from the sewage that was pumped into the water at Stambridge Mills. We would often play there as children, walking out onto the mud at low tide without a care! We often played at Stambridge Mill itself when it was a working mill. When you think back, it was quite dangerous (playing inside threshing machines, for instance) but that never occurred to us then. We also played at Stambridge Hall Farm (owned by the Rankins) and would help the cowman (Mr Lister) bring the cows in for milking. I remember we made castles out of hay bales! World War II lorries were used to harvest the peas from fields at Great Stambridge. We used to grab peas in handfuls out of the back of these lorries as they went past. 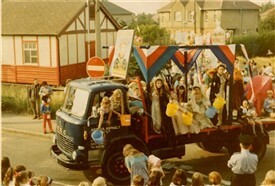 The appearance of the Sharps’ Toffee car in Rochford was an annual event that all the children looked forward to. A man dressed like “Little Lord Fauntleroy” in a top hat and waistcoat would arrive in what I would describe as a “Noddy car” and threw out toffees. Of course, the kids scooped up as many as they could. 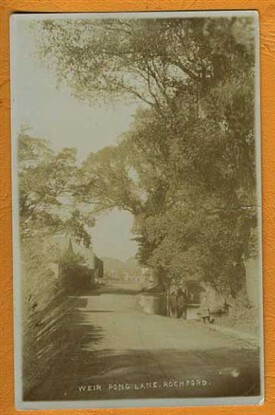 He went along Weir Pond Road, East Street and stopped outside Matthews (which used to be in East Street, near Quys Lane). I climbed every tree along Rochford Golf Course (apart from the poplars) and we used to hide in the hollow tree near the church gate and make noises to scare passing golfers. In what is now the car park in Back Lane was a static caravan park where people lived. The land was owned by the Cottis family and it was closed down in the 1960s. This page was added by Helen Barnard on 09/07/2012. Makes me think about things that were there as a child and are now gone forever.